Ever since Han Dynasty in Old City opened, I’d been wanting to go. I’d gone to the location in Royersford and loved it. And ever since Han had introduced his chef’s tasting menu event on the first monday of each month, I’d also been wanting to go. Random things kept me going to the first few, but I forced myself to make it to the May tasting. And boy oh boy, was it ever an event! Please prepare yourself for immense amounts of food. We had 19 dishes come out. Yes, 19 courses of amazing food. Also prepare yourself for a long dinner. It will take all night, so if you have somewhere to go, forget about it. You’ll be there until after 10PM. I had a great time sitting with complete strangers (hello dining companions!). It’s fun because everyone is there to have a good time and eat good food. I left stuffed beyond belief with a doggie bag. Yes, it was spicy. Yes, I would recommend it to everyone! If I knew the name of the dish, I included it, if not, sorry! We had no idea what we were going to be eating, the dishes just started coming out. Han just brought out whatever he felt like making, and some of what he brought out is not on the normal menu. And that was all part of the fun! So let’s just get started. 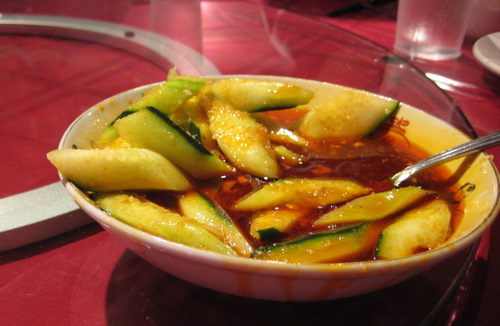 Dish 1 – Cold – Spicy Crispy Cucumber – This was a cold dish with sliced cucumbers in a sweet and spicy dressing/sauce. What a way to start. I absolutely loved this. 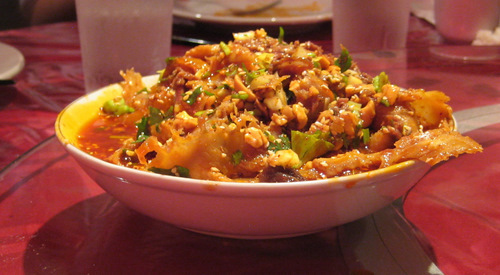 Dish 2 – Cold – Beef & Tripe in Chili Oil – This was another cold dish of sliced beef and tripe in a spicy and oily sauce. This was so spicy that it made my tongue feel funny. Funny like it was all puffed up, which it wasn’t. And when you drank water after this, it made the water taste sour. But the water was just fine. Don’t be at all concerned that it has tripe in it, it’s very good, and I don’t normally even eat tripe. 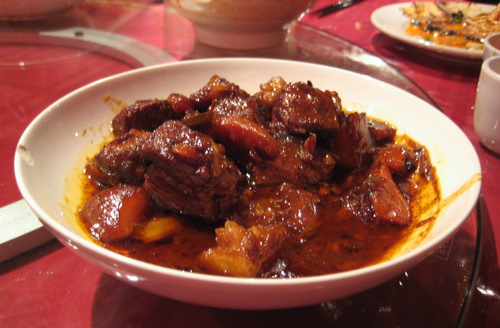 Dish 3 – Cold – Pork Belly in Garlic Sauce. This was another cold dish of sliced pork belly in a garlic sauce. It wasn’t particularly spicy, but it was good. Yeah, it’s fatty, but isn’t that the point of pork belly? Dish 4 – Cold – Spicy Green Bean Noodles in Black Beans Sauce – These are rectangles of green bean sheets with black bean sauce. The green bean sheets are kind of like a tough jello in consistency, but they do not taste like anything. Instead, they take the flavor of whatever they’re in. I’m used to this because we have a similar “noodle” in korean food. In this case, the green bean sheets were doused in a spicy black bean based sauce. There was a bit of bitterness in this, and we’re assuming it’s from the black beans, but we couldn’t be sure. I liked it, despite the minor bitterness. 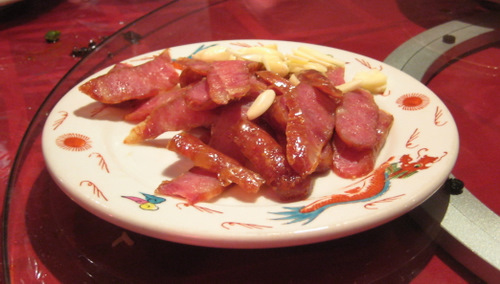 Dish 5 – Warm – Fried Taiwanese Sausage – This is just slices of taiwanese sausage and garlic. This is actually in the hot appetizer section of the menu, but it wasn’t really hot or anything, more like warm or lukewarm. I absolutely love this sausage. It was sweet and savory. I need to figure out where I can buy this! Dish 6 – Cold – Spicy Green Bean Noodles – These are the same green bean sheets, but they’ve been sliced thinner into udon noodle sized noodles. They’re tossed with chili oil. Another great noodley dish! 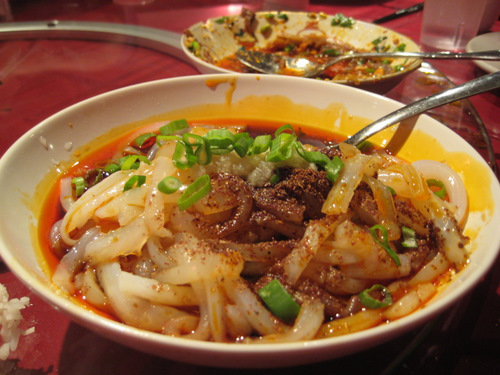 Chili oil is a common theme that runs through the Han Dynasty menu. So just get used to it. 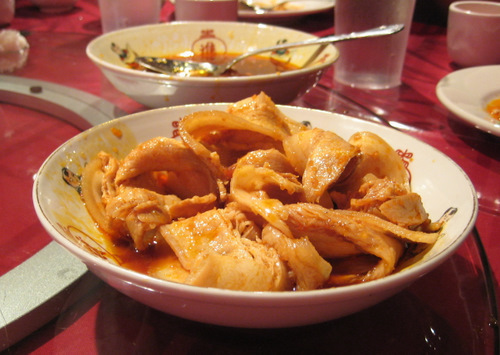 Dish 7 – Warm- Dumplings in Chili Oil – These were pork(?) 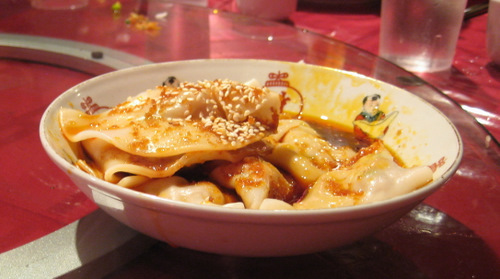 dumplings in a sweet chili oil. I loved these a lot. I wish there had been more to go around! These were not very spicy. 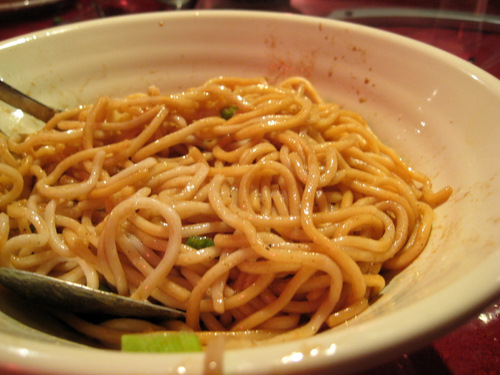 Dishes 8 and 9 – Cold – Cold Sesame Noodles and Cold Noodles w/ Chili Oil – Next up were two noodle dishes. The first was a cold sesame noodle dish which was not spicy. The second was a cold noodle dish with chili oil which was very spicy! They were the same noodles prepared two different ways, and both were great. Dish 10 – Hot – This was our first real hot (temperature) dish. This was pork belly again, but thickly sliced into hunks, with a somewhat sweet, savory, and of course, spicy sauce. It was another winner in my book. These were less fatty, so more meaty. 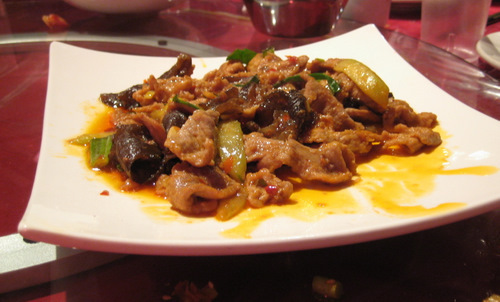 Dish 11 – Hot – Continuing on with the hot dishes, this is a spicy pork and wood ear mushroom dish. I liked this dish because wood ear mushrooms are really the only kind of mushrooms I like! 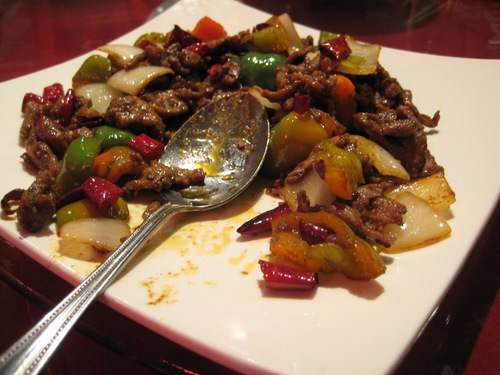 Dish 12 – Hot – Cumin Lamb – This was cumin crusted lamb stir fried with bell peppers, hot peppers, and onions. This was spicy, but in a completely different way than any of the other dishes, and extremely heavy on the cumin! The server said it was a personal favorite. It’s the one dish that didn’t taste very chinese to me, but it was still great. Dish 13 – Hot – Another not spicy dish! 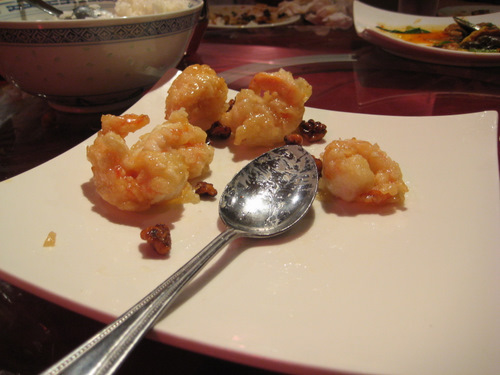 These were some kind of honey and walnut shrimp. It was a nice, sweet, and not-at-all spicy respite from the many other fire dishes. And who doesn’t love deep fried shrimp? The slightly candied walnuts were so good, I cleaned the plate of them! 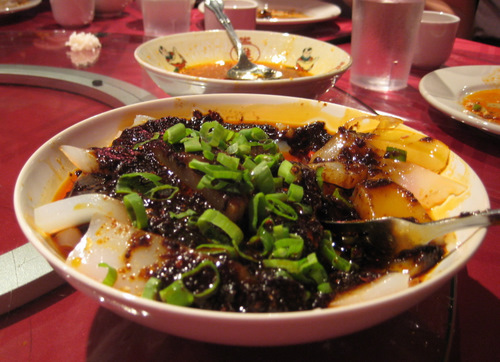 Dish 14 – Hot – Fish Dry Pot Style – This was lightly battered flounder cooked in a spicy hot pot sauce with black mushrooms, bamboo shoots, snow peas, and bell peppers. Han says most chinese restaurants use flounder because it holds itself together well and will not fall apart. What a nice little fact to know because I love me some flounder. 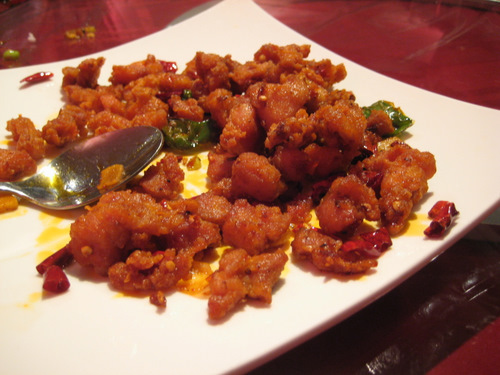 Dish 15 – Hot – Chicken Dry Pepper Style – Chicken is triple flash fried in a mixture of peppercorns, sesame, and dry peppers. These were sort of like spicy popcorn shrimp! But of course, a hundred times better! Even though it was fried, it wasn’t greasy at all. 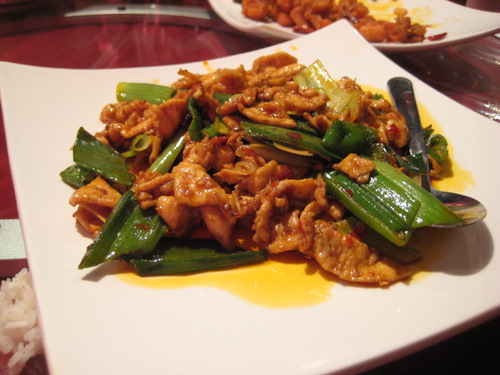 Dish 16 – Hot – Chicken Double Cooked Style – Chicken is stir fried with leeks and hot peppers in a black bean sauce with chili oil. A simple dish with such few ingredients, but that’s all it needs. 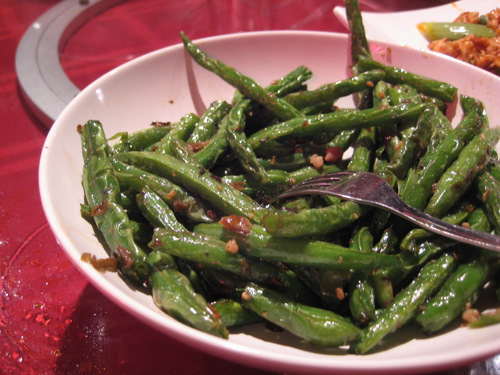 Dish 17 – Hot – A simple stir fried green beans dish. This was only mildly spicy, but majorly good. I love simple veggies like this, especially because I totally dig green beans. Dish 18 – Hot – Beef Hot Sauce Style – This was one of my favorite of the night. 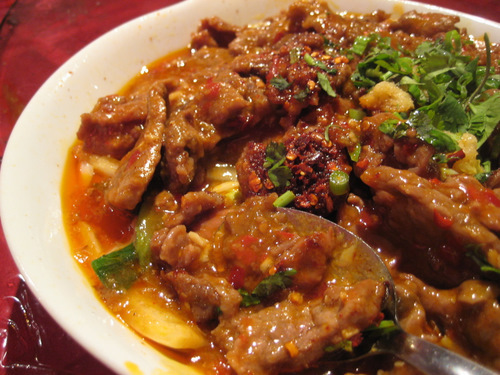 Beef is stir fried with cabbage and celery in an authentic Sichuan hot sauce with dry peppers and garlic. This one has a sort of gravy type of sauce. 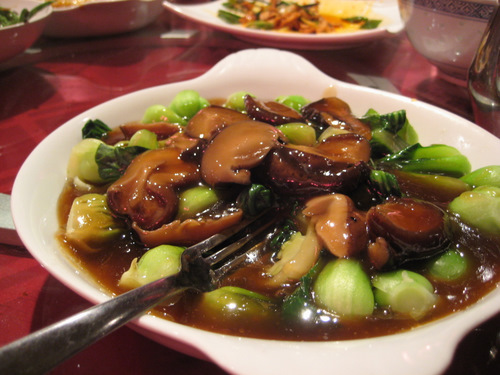 Dish 19 – Hot – Bok Choy w/ Black Mushrooms – This was our last and final dish, a hot and non-spicy veggie one, of black mushrooms and baby bok choy in a gravy. I don’t like mushrooms but I ate up the bok choy, even though I was beyond stuffed by the time this last dish came around. Really, this whole night was intense. It was just dish after delicious and spicy dish. And as much as my stomach could not take it and as late as it got, I did not want it to end. Everyone was worrying about the aftermath of this evening, but I did not have any issues (sorry, tmi!). I would definitely do it again… after maybe fasting for a week in preparation! No matter how little of each dish you eat, you’re still eating 19 dishes. And man, this stomach was not built for that kind of quantity! If your stomach is ready, then don’t miss this deal! Thank you Han for a great night! Oh lord, this all looks delicious. I LOVE the sesame and chili noodles! everyone should try this at least once! and it’s such a deal! Great post!! You don’t like mushrooms????? i only like wood ear mushrooms! all other mushrooms, blech!